Heat pumps like the 3 Ton Rheem 15.5 SEER Heat Pump Split System have grown in popularity because of their energy efficiency and the ability to supply the interior climate you want in all weather conditions. This unit is available via two model numbers: RPQL036JEZ and RHLLHM3617JA. 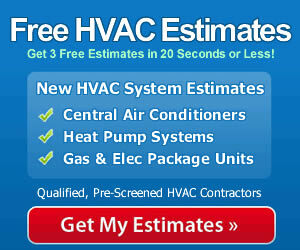 For additional information on costs visit our heat pump prices page. When temperatures rise it offers a 3-ton cooling capacity that delivers 36,000 Btu’s per hour. This Prestige Series unit comes with the patented Comfort Control System to insure steady heating and cooling without significant fluctuations in the temperature that affect your comfort. The Scroll compressor is the choice of most HVAC contractors and is widely regarded as the industry standard in terms of reliability and longevity. The unit is pre-charged with environmentally safe R-410A refrigerant and it is convertible for use in either vertical or horizontal installations. For heating your home the Rheem 15.5 SEER Heat Pump Split System comes with a heat strip sized to fit your specific application. The onboard diagnostics and LED readout make it easy to discover the source of system malfunctions and quickly correct minor issues so you can get right back to heating or cooling your home with outstanding efficiency. That efficiency is a provided through an outstanding 15.5 SEER which qualifies this unit for the federal HVAC tax credit that may put up to $1500 back in your pocket. More good news comes by way of a 10-year limited warranty on both the compressor and all additional parts. Look for the Rheem 15.5 SEER Heat Pump Split System for approximately $2900 to $4300 for the components. Finding an installer to give you a simple and accurate installation quote can be a frustrating challenge so you’ll have to work the phone to determine which 2 or 3 you’ll have out to look over the specific requirements of the job and hand you a written estimate. This versatile unit will offer excellent heating and cooling wherever you live, but the way they function is ideally suited to moderate climates. The inclusion of the heat strip in this model adds auxiliary heating on cooler days, too, so it is an option in colder regions. 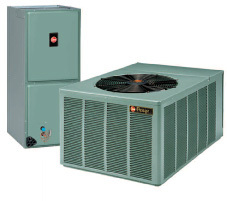 If you’ve decided to go with a split system heat pump that offers high efficiency and lower energy bills the Rheem 15.5 SEER Heat Pump Split System is definitely worth considering.